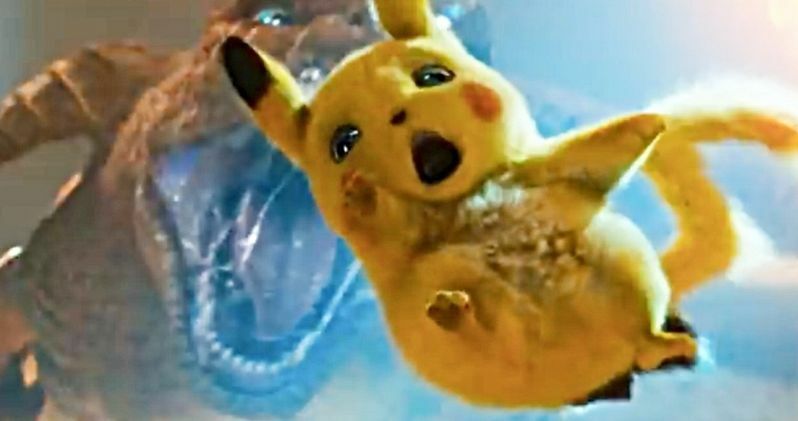 Warner Bros. and Legendary Pictures dropped a big fat surprise online today in the form of the first trailer for Detective Pikachu. This serves as the first ever live-action Pokemon movie and the first footage didn't skimp on the goods. The trailer is loaded down with Pokemon from various eras that should make most fans quite happy. To help catch people up on anything they may have missed, here are all of the Pokemon, in order, that we spotted in the trailer. The opening shot of the first Detective Pikachu trailer takes place in Ryme City and there is a tremendous view with Pokemon and humans shuffling about together. That makes it a bit difficult to spot everything, but we see a Charmander, Dodrio and Bouffalant all mixed in with the crowd. There are also a number of flying Pokemon in this shot, including a Braviary on a ledge, as well as Comfey, Flabebe and Pidgeotto flying overhead above the city. It's possible that some other flying Pokemon are in the shot, but since they're a little hard to distinguish, it's tough to make out any others specifically in that opening shot. We're then treated to a quick glimpse of Psyduck, who is featured a couple of times in the footage. We then shift to focus on the main human character Tim (Justice Smith) for a spell before the main attraction pops up in the form of Pikachu, as voiced by Ryan Reynolds. Pikachu is easily the most iconic character from the franchise and looks absolutely perfect. Aside from Reynolds cracking wise as Pikachu for most of the trailer, we do get a classic "Pika, Pika" moment, which works as a nice bit of fan service. Ultimately, it's Detective Pikachu that is going to be taking us through this world that is jam-packed with these beloved fictional creatures. Another key shot includes a pack of Bulbasaur and Morelull, before moving on to a shot of Jigglypuff. Positioned behind her are Machamp and Primeape. Most of these Pokemon are from the original run. However, Morelull is the standout as the creature was only introduced much more recently in the games Pokemon Sun and Pokemon Moon, released in 2016. The footage then shifts to the Pokemon version of Fight Club, where we get a brief look at a half-covered Squirtle, as well as Rufflet. But, it's Charizard who steals the show in what could be the arguable money shot of the entire trailer. Anyone who got into Pokemon in the early days coveted Charizard and it's great to see him looking so faithfully powerful in live-action. Moving on, we then see a cool shot of several Greninja, a somewhat surprising inclusion. We then move on to the extended scene featuring Pikachu interrogating Mr. Mime, who winds up being something of a standout in a great bit of slapstick comedy, utilizing the Pokemon's powers perfectly. That's mostly it as far as Pokemon we were able to identify in the flesh. The trailer is truly packed. Other Pokemon to keep an eye out for, not in the flesh, include Vanillish, Rayquaza, Reshiram and Zekrom. Elsewhere, scattered about in various shots in mostly blink-and-you'll-miss-it moments include Bouffalant, Aipom, Pancham, Joltik, Venusaur, Audino, and Emolga. There are, however, other Pokemon featured elsewhere. Tim's room has posters featuring Legendary Pokemon such as Dragonite, Hypno, Gengar, Blastoise, and Flygon. There are also a few neon signs in the trailer depicting Pokemon such as Victini, Wooper, Goomy, Swirlix, and Petilil. Detective Pikachu is set to hit theaters on May 10, 2019. In case you missed it or want to focus more specifically on any of the Pokemon, check out the trailer from the Warner Bros. Pictures YouTube channel below.